University of Notre Dame Press, 1995. 242 pp. In this innovative study, Thomas S. Hibbs goes against the grain of most that its subject is Christian wisdom In the process of making his argument, Hibbs also demonstrates that the Summa Contra Gentiles is the most important of Aquinas's texts on the relationships between faith and reason, theology, and philosophy. 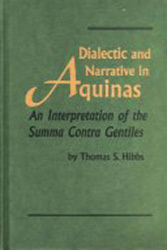 Since the Prologue of the Summa Contra Gentiles has been the focus of nearly all the debates over the work, Hibbs begins by examining it and the controversies it has provoked. He then goes on to suggest that the method of the Contra Gentiles is dialectical and that its unifying principle is provided by the narrative structure of scripture. The chapters that follow are devoted to each of the Contra Gentiles' four parts. In the concluding chapter Hibbs considers in detail the narrative unity of the Contra Gentiles and brings themes from Aquinas into conversation with contemporary work in genre theory.